Scotch egg at The James. But that would deprive you of two months of great food, drink, and hospitality. It would also be reductive, cramming something genuine and sincere into a leprechaun costume and asking it to dance a jig. The James is an Irish pub, to be sure. It’s run by two Irishmen, Stuart Henry and Cormac Dowling. There’s traditional Irish music every Sunday. The bartenders pour a proper pint of Guinness. But what makes it a real Irish pub is the way everyone comes and is welcomed: friends, sweethearts, grandparents, babies, the commuters who walk off the train and directly into the stone building beside the tracks, all mingling together. It’s the spirit of the place. So come on in. Hang your coat on the hook by the door, piled on top of all the others. While you’re waiting for a table, or before you cluster in at the L-shaped bar, watch the chefs in the open kitchen or peruse the cookbook shelf. The restaurant was once a train station, and some of the walls are lined with the original granite; others are covered in pretty patterned wallpaper or painted dark peacock green and hung with vintage photos and old clocks. Throw pillows line the banquettes. It’s cozy, and if it’s busy, it is very, very loud. And, yes. 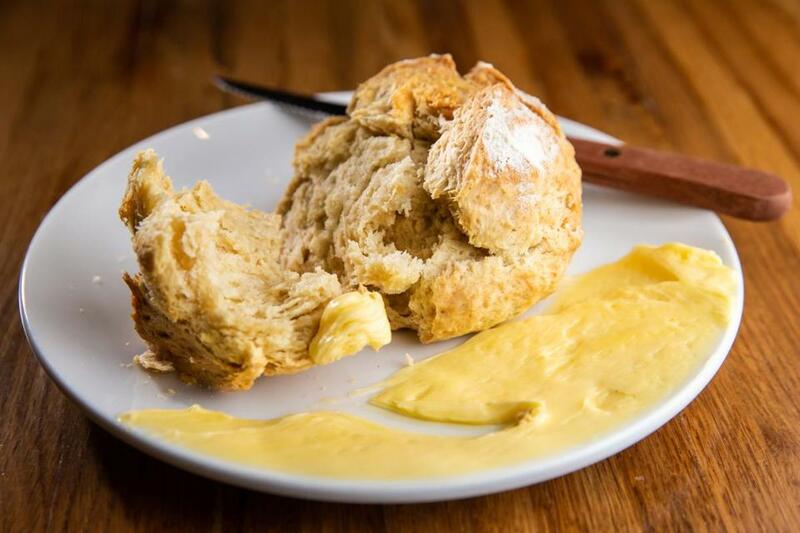 Don’t miss the soda bread, a craggy mini loaf impaled with a knife and served with a luxurious schmear of Irish butter sweetened with honey. Or the short rib and ale pie. It’s excellent: rich bites of meat tucked beneath a blanket of puff pastry, a little pitcher of horseradish-spiked mascarpone alongside. 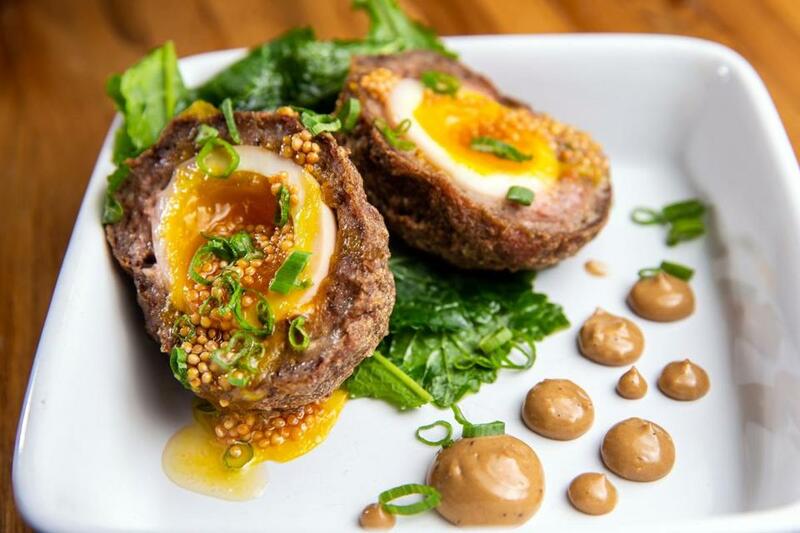 The James also serves one of the best Scotch eggs I’ve ever had, runny-yolked, encased in lamb sausage, with black-garlic aioli and tangy pickled mustard seeds that pop between your teeth. A Guinness lamb stew special one night provides maximum winter coziness. There’s a satisfying burger draped in Irish cheddar, and a bowl of plump mussels in garlicky broth spiked with Belgian beer, served with slabs of grilled bread. All of this pub fare is great: well prepared with fresh, local ingredients, balanced flavors, and a careful hand. That’s chef Alex Horowitz (Blue Ginger) bringing his training to bear. There’s no fish and chips here. There is an oyster roll with white kimchi. Modern Irish food has moved so far beyond how we think of it in this country, merging the region’s produce, seafood, and glorious dairy with influences and techniques from around the world. It’s an exciting place to eat, not a hidebound one. That’s the view the menu at The James takes, as well. There’s toast swirled with fat curlicues of chicken liver mousse, topped with cranberries and hazelnuts, drizzled with saba (a syrupy, reduced grape juice) and accompanied by pickled onions. It is a riot of flavors and textures, a delight to eat to the last bite. Grilled jerk prawns are juicy, with a heady, building heat offset by mellow sweet potato puree. 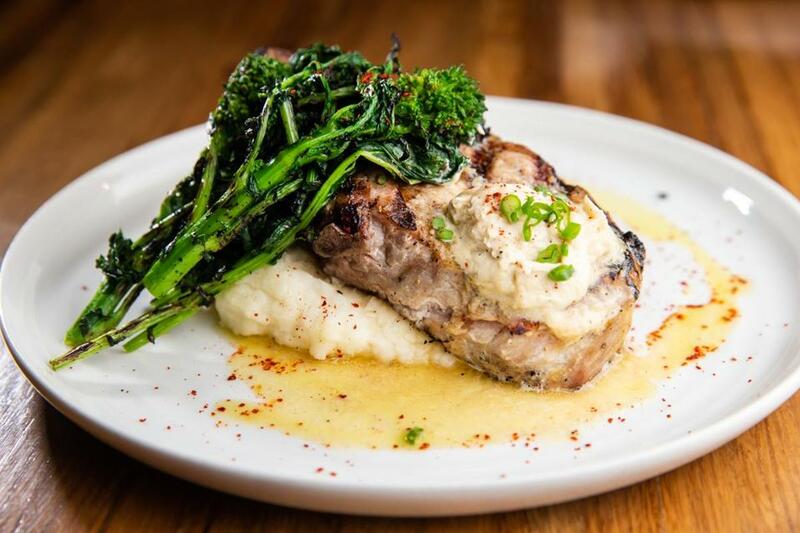 A thick pork chop is rosy at the center, served with a generous drift of mashed potatoes, pleasantly bitter broccoli rabe, and sweet-savory ginger-maple butter. Octopus is tender and mild, bites of the charred tendrils laid out atop a lemony chickpea puree and scattered with crisp chickpeas. This is proper pub food circa 2019. There are some things I probably wouldn’t order again: spicy beef tartare with mint, fried shallots, harissa, and yogurt, the meat hand-cut into bigger, thicker pieces than usual, a choice but not one that spoke to me; a well-intentioned, well-conceived, but undercooked root vegetable salad with Middle Eastern spices. Desserts are simple satisfactions — pecan pie, say, or chocolate bread pudding. They may not be hugely memorable unto themselves, but when my son tells a staffer that the next day is his birthday, at the end of the meal the bread pudding appears before him, along with candles to blow out. That kindness is memorable. It’s what keeps me coming back to The James. Sometimes I just want to surround myself with fine people, and no airs, and have a good old-fashioned nice time. Also brunch is really good, worth driving out of one’s way for, with things like fried oysters and waffles and veggie farro “fried rice” alongside the classic Irish breakfast. There are pitchers of Bloody Marys and punch, plus something called the Green Machine, made with mezcal, avocado syrup, and smoked salt. Ultimately, The James is a pub, and you want to come here for a drink. The bartenders are very good at what they do. I’m partial to the X, Rye & Z cocktail, made with Old Overholt, lemon, ginger-orgeat, and Angostura bitters. But I’m not at all sad when I force myself to branch out to things like the Frawley Sour (Fernet, Chartreuse, lime, and simple) and the Porto Flip, with cognac, port, egg, and nutmeg. And you won’t just find a good Guinness, but also beer selections like Second Fiddle from Fiddlehead Brewing Co. in Vermont, a hop-geek’s dream. 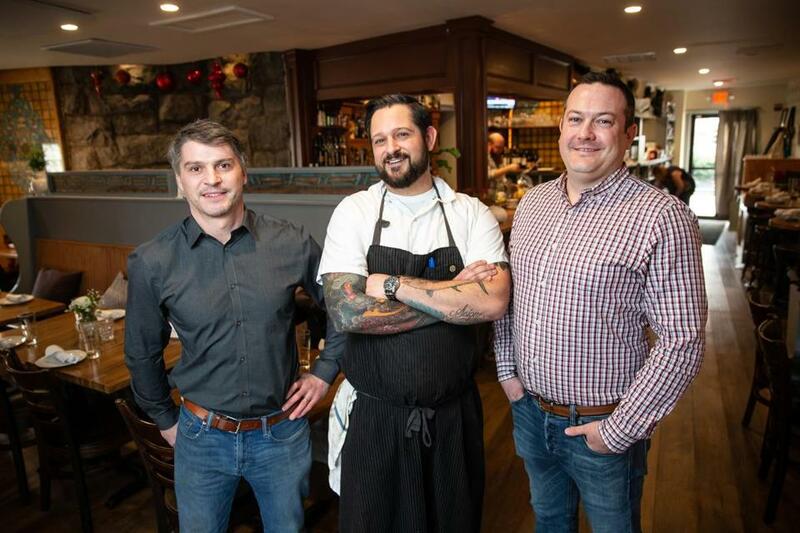 From left: co-owner Cormac Dowling, chef Alex Horowitz, and co-owner Stuart Henry at The James. Henry and Dowling met bartending at Brookline’s Washington Square Tavern, whose alumni went on to start several small, cozy places that feel similar to The James: the Abbey in Brookline, Porter Cafe in West Roxbury. It’s not particularly surprising to enter one night and find Matt O’Keefe, previously of Redd’s in Rozzie and Buttonwood in Newton, working here; all have the same kind of pleasing neighborliness. In an environment where restaurants seem to be closing on a daily basis, this kind of local standby feels increasingly important. On a recent weeknight, I look around and realize that it’s been a while since I’ve sat in a restaurant this busy. “Men, women, children, and muddy boots welcome!” says the website. That’s how it feels at The James, where there’s something for everyone, and friendliness for all. Modern Irish food has moved so far beyond how we think of it in this country, merging the region’s produce, seafood, and glorious dairy with influences and techniques from around the world. 1027 Great Plain Ave., Needham, 781-455-8800, www.thejamespub.com. All major credit cards accepted. Wheelchair accessible. Prices Appetizers $5-$16. Entrees $16-$26. Desserts $6-$10. Hours Dinner Sun-Wed 4:30-10 p.m., Thu-Sat 4:30-11 p.m. (bar 4 p.m.-midnight daily). Brunch Sun 10 a.m.-2:30 p.m. Noise level Extremely loud when crowded. What to order Soda bread, chicken liver mousse toast, Scotch egg, jerk prawns, short rib and ale pie, pork chop.